The simplicity of these gray stripes paired with cream and orange flowers just speaks volumes in regards to card inspiration. Take these colors and transform them into a classic card that captures the beauty of the photo. Experiment with stamped flowers or die-cut florals. Add stripes using delicate Sheer Basics striped vellum overlays or cover plates. Let the photograph speak to you and see where it takes you! Oh My – the most adorable little shoes, but the colors are yummy goodness! Will be fun to play with, for sure! I actually have this exact photo pinned on my Cute Baby Stuff board! What a great inspiration pic. 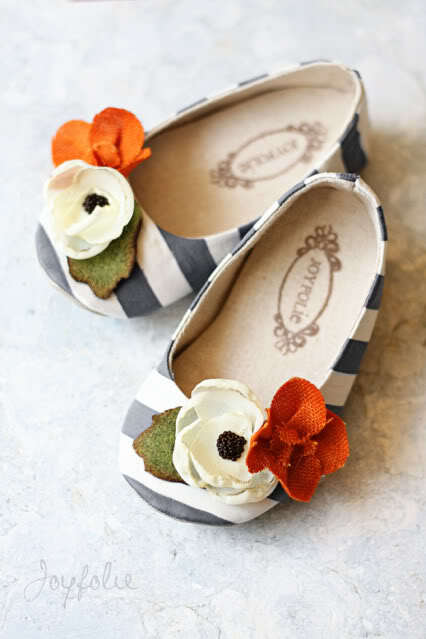 These little shoes are adorable — in fact I want a grown up pair of my own! I was so inspired I ran to the craft room and made a card. Now if I can just remember to share it on the 25th!